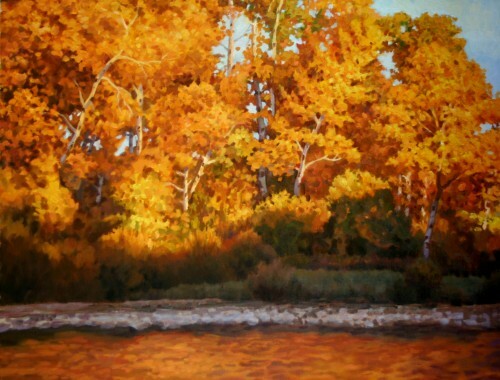 « Why Get Outside to Create Landscape Art? When painting no matter how long you have done it it’s always best to remember the basics. Sometimes this doesn’t happen either because you are just learning and still figuring out exactly what to do or you have experience painting and aren’t giving it much thought. It’s the most basic of concepts and yet it has one of the greatest impacts on the look of your painting, it’s the angle you hold your brush in relation to the canvas. Using a paint brush at an angle close to 90 degrees to the canvas will cause the paint you apply to mix with whatever paint is on the canvas or if there is already thick paint on the canvas then applying paint this way will carve into the layers of paint on the canvas. However when painting with a brush at an angle that is almost parallel to the canvas it will lay the paint onto the surface differently, spreading it on almost like butter on toast, when using this stroke on an area with thick paint layers this will lay down paint onto of the earlier layers of paint beneath. Varying the angle of your stroke somewhere between these two extremes will give you slightly different effects, somewhere between carving through the paint and spreading it over the paint beneath. Experiment with the possibilities and your control over your painting will increase dramatically.